Q: What’s the goal of Warrior 2020? Q: What has been the development path for Warrior 2020? A: Traditionally we have developed the soldier’s equipment/gear - uniform, load carriage equipment, combat belt, winter clothing, etc and then procured subsystems which were added to complete the system. Good examples of this approach are Soldier Equipment Model -91 and Soldier System M/2005. After introducing the M/2005, we decided to look at the next generation Soldier System (W2020) as a whole and not to rush its development. The Warrior 2020 study was started at the beginning of 2006, just after introducing Soldier System M/2005. The first phase was to define operational requirements for the future and analyse what might be the major changes in future operations within the next 10 to 15 years. That basic work was done during 2006-2008. To be honest, this kind of process will continue throughout the definition and development phase. After studying the LOI countries Common Staff Target document – which was the rationale for the EDA’s CEDS (Combat Equipment for Dismounted Soldier) work – and finding lots of similarities in our own operational baseline document, we decided to join the CEDS programme. Since 2007 we have been developing the common staff requirements (CSR) within the framework of the EDA with eight other nations. Q: What trialing has been done thus far to help formulate the requirement? Consequently, we have procured different kinds of test equipment - ballistic protection, new weapon systems, Non Lethal ammunition, sensors and night vision devices, short range radios and range finders for test purposes and have been conducting field trials. The requirement is that all those sub-programmes mentioned above shall develop a prototype system for test purposes. Q: Legacy equipment and the issues related to them figure strongly in all SMPs. What decisions have been made about existing equipment for Warrior 2020? A: Study and testing will tell us what legacy equipment will be retained in the next ten to 15 years in our operational units. To be able to equip large war time reservist Land Forces we have to utilise our most modern existing equipment after 15 years. This means that when we start procuring the Warrior 2020 System for operational units, their existing equipment will be transferred to territorial units. At the moment there has been a lot of discussion about the effective calibre for assault rifles. Our 7.62X39 cal assault rifle has proved to be effective in demanding environments. It’s quite sure that the majority of the soldiers will have the Finnish 7.62x39 assault rifle in 2020. Q: What is being done to improve capabilities prior to the entry into service of Warrior 2020? A: Based on our capability development plans, the focus in the near future is to improve our Special Forces units with an all capability area and night fighting capability and for operational units by procuring night vision goggles, weapon night sights and night observation devices. Those equipments will be integrated in our Soldier System M/2005. Q: How does Finland’s policy of Total Defence influence your requirement for Warrior 2020? A: Our challenge is to support a large reservist Army and the ability to equip all troops. We have to find a cost effective way to renew systems for our operational units and use effective existing equipment with territorial units. Our basic principle has been (and will be in the future) that we train and equip units for their special tasks. For example, we have units for MOUT operations and they are trained for that and have special equipment needed in urban operations. Territorial units are trained for defensive operations and they don’t need the same kind of mobility as operational units which are trained and equipped for offensive operations. Q: What influence does the need to support peace keeping operations have on the design? A: Our troops are operating in Kosovo, Afghanistan and Chad at the moment. The starting point is that we develop/procure materiel meant to be used for National Defence. On the other hand – based on the latest Defence White Paper ‘Finnish Security & Defence Policy 2009’ – there is a requirement that, “The troops can operate in all forms of crisis management, ranging from combat forces tasks to humanitarian operations.” So we have to take that into consideration while developing the W2020 system. Q: What is your approach to C4I in the programme? A: Because of our doctrine and large number of different type of units we have to put our existing communications system to good use for territorial units in the future. For the W2020 concept however we are looking for something new. By having both old existing and new the challenge is the interface between the communication systems. Q: How is the work on soldier modernisation at NATO and the EDA influencing what you do? A: Our point of view is that NATO and EDA are not competing organisations. 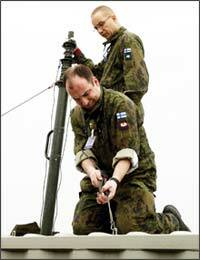 We are participating in NATO Land Capability Groups (LCGs). What we see is that NATO is focusing on standardisation and common interfaces. EDA, for their part, are working with common requirements and encouraging common procurement programmes within the framework of the EDA. The only way to develop a relationship with NATO in the area of soldier modernisation is to participate in LCG 1 and it’s working groups. Q: What are your views on multi-national co-operation and joint development of systems with other countries? A: The fact is that the complete Warrior 2020 System will be very expensive. Development costs are a major part of those costs. At the moment we don’t see it as sensible to develop a unique Finnish Soldier System. Based on that fact we are looking for partners who have the same (or almost the same) requirements for their Soldier System as we do. Important issues for us are cold temperature resistance (because of our Scandinavian location) and simplicity/usability of the system. Q: What role is there for Finnish Industry in the programme?